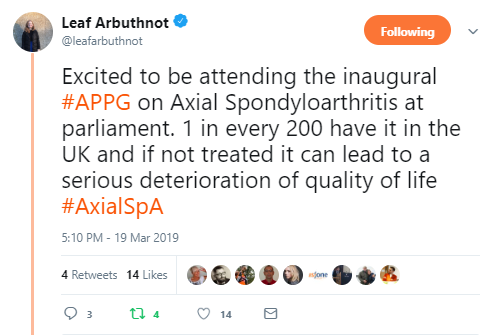 Last week saw a momentous event for people living with axial SpA (AS) in the UK. We held the inaugural meeting of the first ever parliamentary committee specifically on AS. Parliamentarians, policy makers, clinicians, healthcare commissioners and NASS members and staff came together to identify and address our concerns about AS care. I want to reflect on that meeting, but before I do, let me set some context. 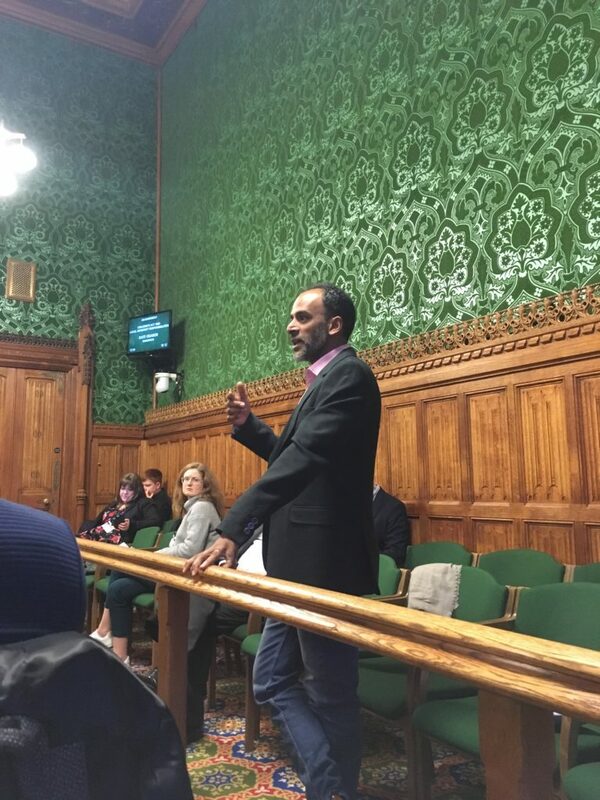 Our work began nine months ago when we asked to meet parliamentarians whom we knew had some interest in AS. In those initial meetings we expressed concern about the average time to diagnosis in the UK of 8 ½ years and its impact on people’s lives. 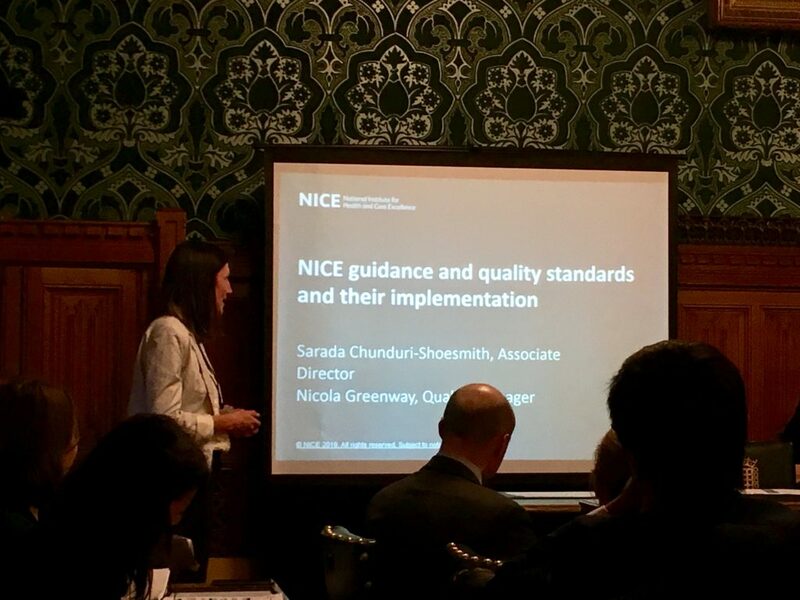 We talked about the positives too – in 2017 the regulator National Institute for Health and Care Excellence (NICE) produced clinical guidelines for the diagnosis and management and spondyloarthritis, and in 2018 it produced a Quality Standard for AS which sets out for commissioners and providers key areas of care that they should implement. The Quality Standard says that adults with suspected spondyloarthritis should be referred to a rheumatologist and then have an MRI scan. Those with confirmed spondyloarthritis should be referred to a specialist physiotherapist for a structured exercise programme, they should be given information about their condition and told which healthcare professionals will be involved with their care and how to get in touch with them. So far so good. But here’s the problem – nobody has responsibility for ensuring that the Quality Standard is implemented right across the country, and there is no incentive or penalty for commissioners and providers that don’t implement it fully. At NASS we want to ensure effective and widespread implementation of the Standard across the country so that Every Patient, Every Time receives timely diagnosis and effective care. So what should we do? 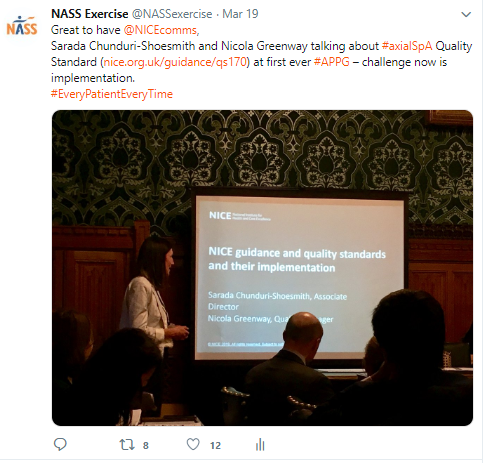 The advice we received was to set up what is called an All Party Parliamentary Group (APPG) and to give it a very, very specific remit – to provide national oversight of the implementation of the Quality Standard. 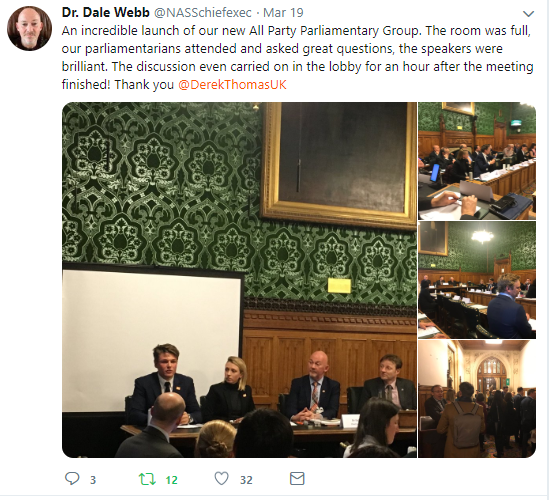 We were later told by NICE that this specific role has never been given to an APPG before in another clinical area and we were applauded for leading the way. We continued to build support for our idea and soon we had enough MPs and peers who were willing to work with us. 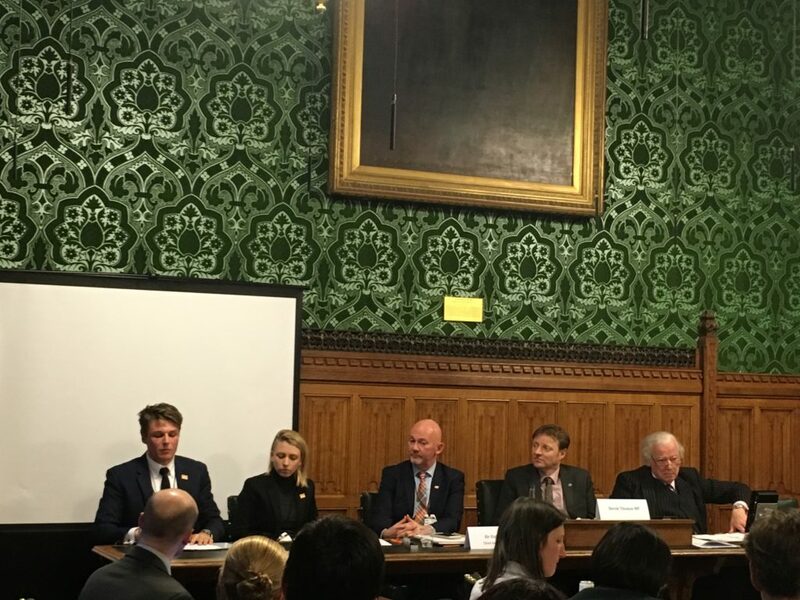 At our Parliamentary reception in December we announced the formation of the APPG. 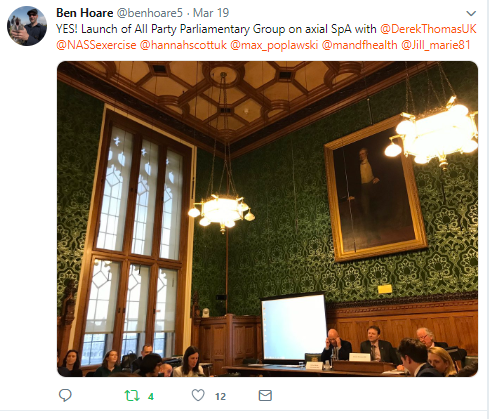 Derek Thomas MP kindly agreed to Chair, and Lord Campbell-Savours – who has axial SpA (AS) – kindly agreed to Chair. Both of them spoke at our event and I was proud of the progress we had made. 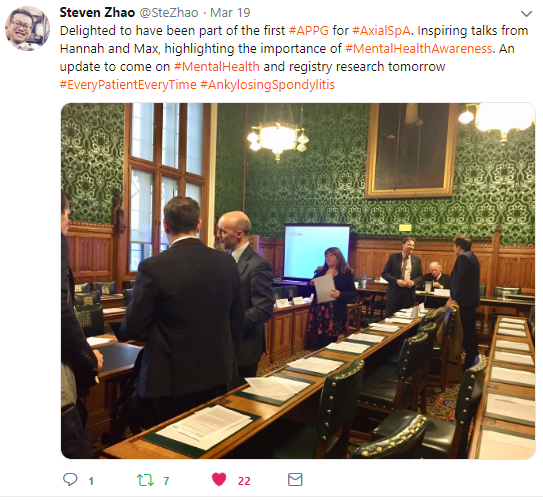 This was also the first time that a parliamentarian had spoken publicly about his experience of having axial SpA (AS) and the impact on his life – including having to give up a job on the front bench as a Minister. It was very moving to hear. In January we set about the formalities of establishing the group, setting the date and inviting speakers and guests. I couldn’t have been more pleased with the outcome. 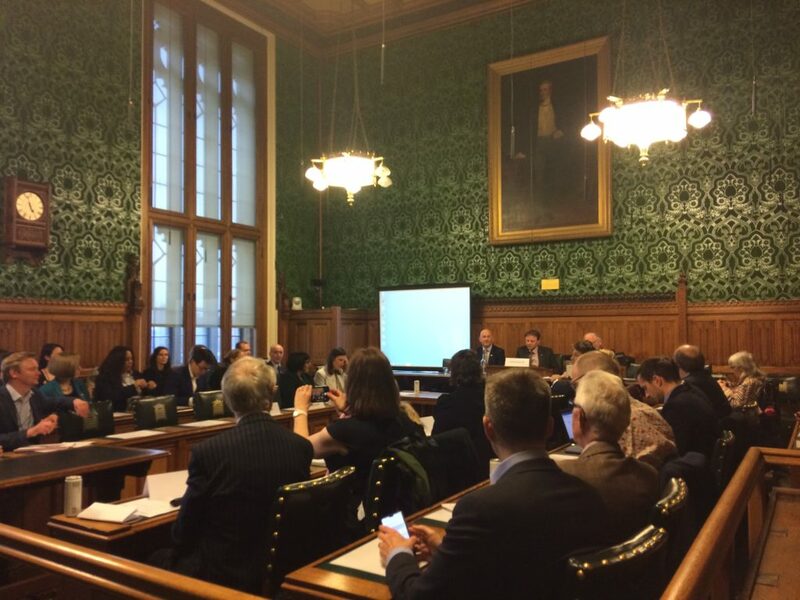 Fifty people attended, filling out Committee Room 9 in the House of Commons. Parliamentarians present expressed their concern at the time to diagnosis. 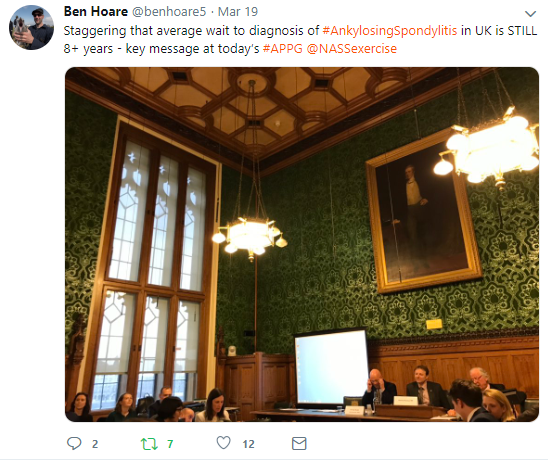 They heard two contrasting stories from NASS members – one from Hannah Scott who has diagnosed very quickly and one from Max Poplawski whose diagnosis took 5.5 years, having first shown symptoms at the age of 12. Our speakers were incredibly eloquent and compelling and demonstrated just how debilitating and distressing it can be as a young person living with painful symptoms and having to cope without diagnosis or treatment. 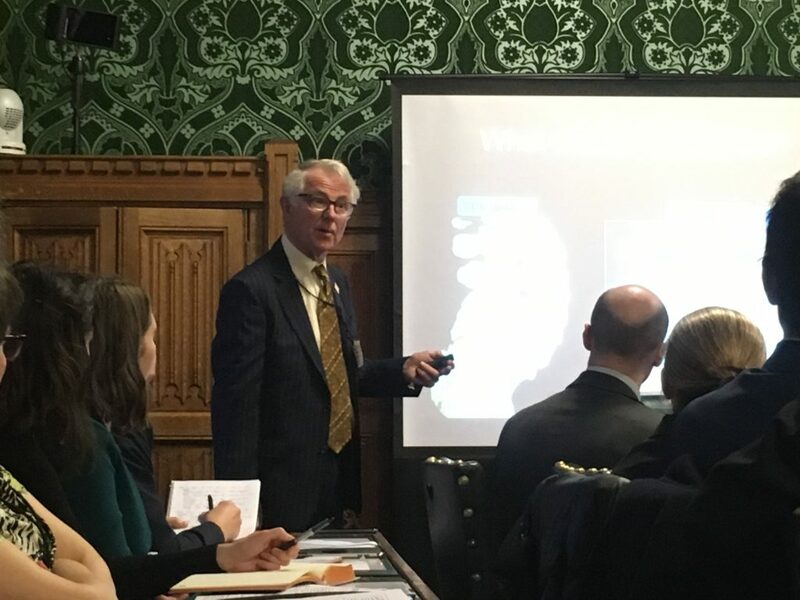 Parliamentarians agreed that the APPG now provides an important opportunity to shine a light on the quality of care for patients living with axial spa, to identify areas where care is good and understand why, and at the same time identify those places where care needs to improve. It provides an opportunity to understand, learn and create change. 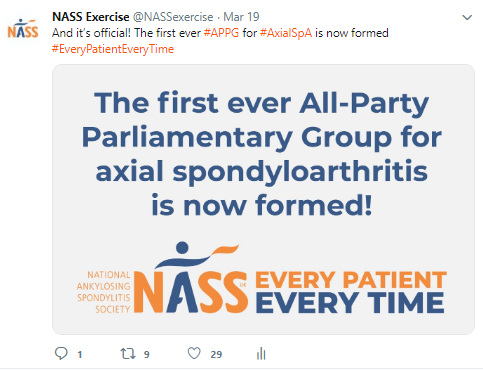 NASS is proud to have the distinction of being the first charity in the world set up to provide information and support to people living with axial SpA (AS). We are proud to advocate on behalf of patients and we were determined to ensure that Every Patient, Every Time gets early diagnosis and effective care. So what next? We will now undertake a Freedom of Information Request (FOI) to every hospital and commissioner in the UK. Those organisations have a legal obligation to reply to us within 20 working days. 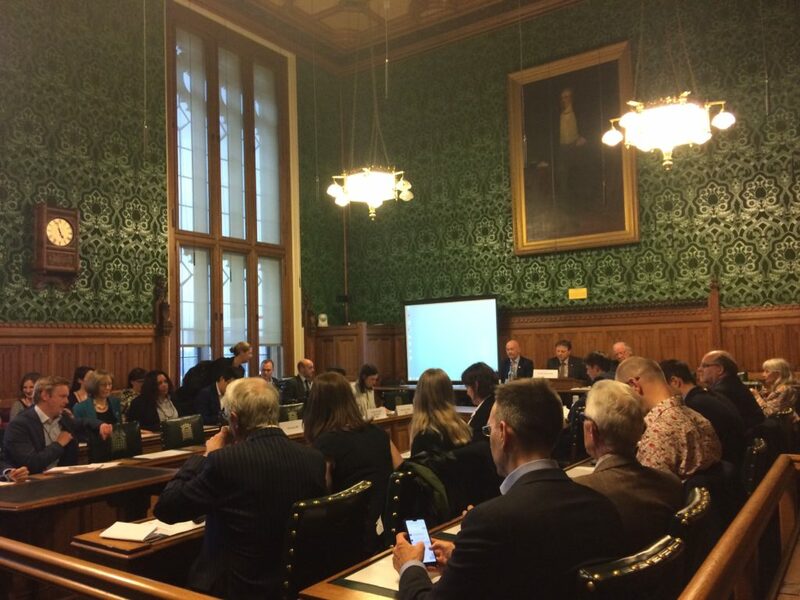 We will analyse the results and bring them to the next meeting of the APPG in July for discussion. We will then publish a report under the auspices of the APPG. We are not seeking to name and shame, but we are going to be clear about where care needs to improve. 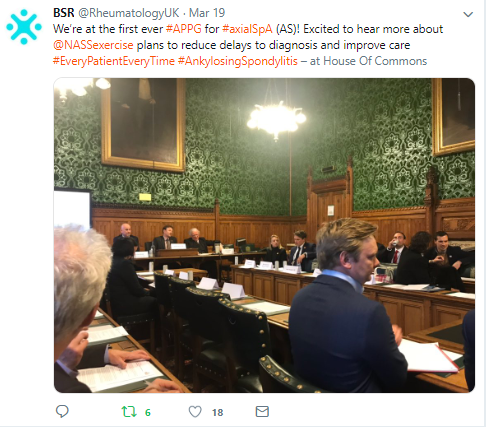 We will also bring to the committee examples of rheumatology services that have reduced their time to diagnosis and ask the question – what have they done to achieve this, and what can other hospitals learn from these examples? 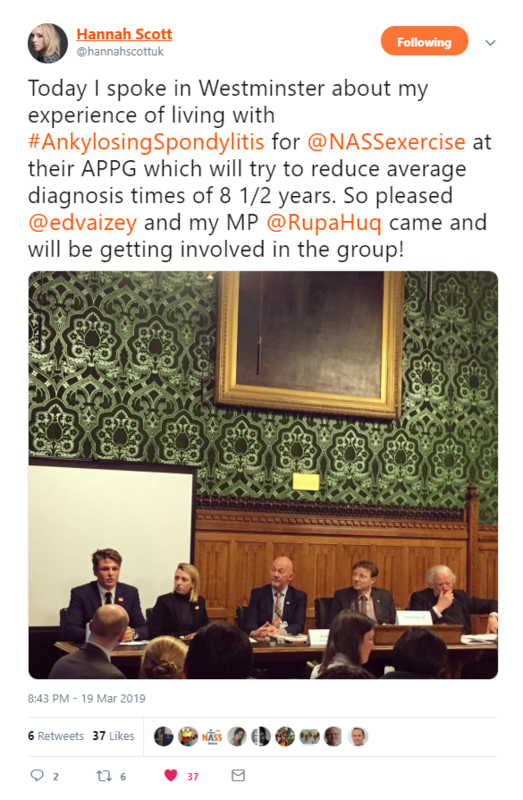 The APPG is an important part of our Every Patient, Every Time campaign, but there are other things we are doing to improve diagnosis and care. For example, we are working with clinicians who are committed to driving improvements in their services. We have launched Aspiring to Excellence, a quality improvement programme. Participating services will work together and with technical experts to innovate, share their experiences and stimulate improvements across the UK. We will be announcing the names of those who have been selected for the first round at our NASS Voices conference in London on November 16. NASS is working hard to raise the profile of NASS higher than it has ever been. Please, if you are not already a member of NASS, do join. Help us to keep the pressure up, because every person with axial SpA (AS) deserves the best care, Every Patient, Every Time. Learn more about our Every Patient, Every Time campaign here.